60mins: a bit of roller-coaster. As said for NDX and SPY, this little hiccup was expected a little later, but NDX's madness triggered some selling on stall level, bringing the whole market down. RUT could test 828 for support first, and 843 is a new resistance which will be harder to break. Note: The gradient of the AdStoK green line should also give us information on whether we're heading for a turnaround or a V shape pattern. Daily: Congestion to mildly up. AdStoK is very overbought and is now showing some weakness. The white line crossover will give us interesting information shortly. Entropy is lower but there is no reason to panic: the trend is still UP! Yesterday's down day did not even change the colour of the daily bar, which is still blue. Support: 828 (likely), then 812 (unlikely in the short term). It was clear RUT would hit 851 (highs + Fib) but what is now coming next? AdStoK and Entropy do not point lower, so one should not panic just yet. RUT is likely to hold or even go higher. Strong MM resistance is still 875. Market direction: Congestion. Upward bias still valid. 60mins: Testing support on 154.65. Possible congestion. It seems that NDX's madness triggered that profit taking on stall level. SPY is also teetering with all time highs so was also subject to profit taking. 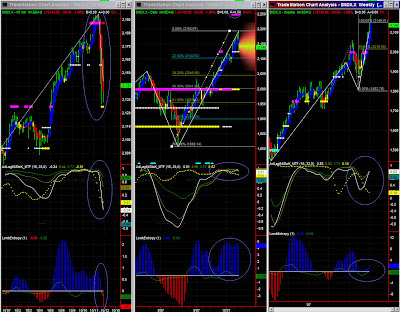 Lower time frames seem to confirm that 154.65 has to be tested (MM + Fib). It is too early to anticipate contagion and broad selling pressure. Entropy is however quite low, so one may enter a trading range [154.50-156-50] for the time being. AdStoK is so overbought that this little hiccup of yesterday had to happen. I personally was looking for a trigger point within a few days, but NDX's quick run to stall level precipitated nervosity and selling. 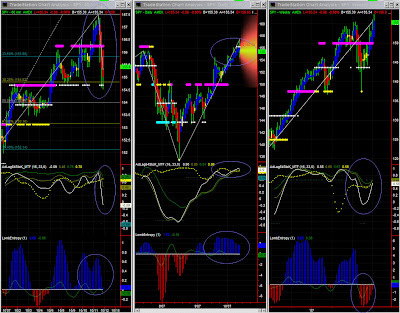 Entropy is still fairly high, and AdStoK while overbought is not pointing to any strong retracement. We should have some increased volatility in the next few days, then a direction should emerge as a breakout of the [154.50-156-50] trading range. The Swing indicator is now more firmly up, but the key swing price level is still close at this time frame. Entropy is slowly looking better, and the trend should be at least mildly up until AdStoK lines cross. So, for the time being, no visible change in market dynamics coming. One will have to keep an eye on AdStoK when lines cross, as there is a chance of divergence in this indicator with lines joining at a lower level than prices (double top later on?). 60mins: Consolidation around 2125 support level. Possible trading range. Despite the strong bull run, 2188 was given as an important test level. Selling on that level has been as crazy as the previous rise, and should now stop on 2125. We'll have to watch that level of course, but preferably in a lower time frame (for entry/exit), or EOD for the general trend, which will both have a much higher significance level. 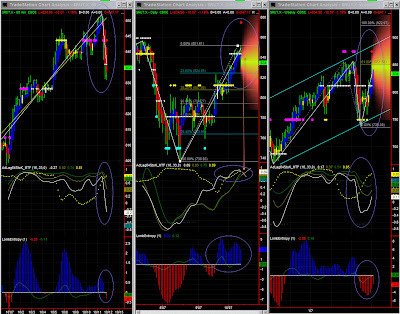 Daily: Despite yesterday's hiccup, no change in trend for now, but still very very overbought. Possible tug-of-war. This profit taking session had to happen, and I expected it to happen a little later, probably triggered by other indices. We however had a special configuration with a strong MM resistance on the 60mins chart at the same level as the MM stall level on the daily chart. Levels to watch: 2125 and lower Fib levels, but one should not panic as there is still a lot of accumulated energy in the market. NDX could just as well bounce to 2250. AdStoK lines should soon meet, but significance level is so low at this time frame, so this is nothing more than a background information. One can however notice a divergence, hence there is a possible slowdown on forthcoming resistance and line meeting point (within a couple of weeks).